Summary: The first five sides of the album run slightly fast on some (all?) copies of the LP; all CD versions run at the same, slightly slower speed. The original Ryko, EMI, and Zappa Records CDs were on two CDs, as is the current 2012 reissue. The 1995 Rykodisc reissue, meanwhile, mimicked the three-album presentation of the original set, but contained a segue between "Why Johnny Can't Read" and "Stucco Homes" that was not on the original LP. The 2012 CD is getting good reviews and, since it lacks the segue from the 1995 disc, is probably your best bet. Avoid the 1990 Zappa Records CD (CDDZAP 19) like the plague; it's part of the infamous "bad batch." On the original double CD, "Shut Up & Play Yer Guitar" was mislisted as "Shut Up & Play Yer Guitar Some More", and vice versa. The track order was not messed up, only the printed titles. Shut Up and Play Yer Guitar box set... The UK version (66368) has red sleeves, but the photo of Frank is nicely printed in B&W... the normal one showing him smoking, complete with turned up polo collar and all. The US version (w38292) has blue sleeves, and the photo is printed in that same color blue/white scale... sublimating parts of Zappa into the sleeve itself. According to some eagle-eared listeners, many copies of the record--but not the CDs--are off pitch by approximately 4/5 of a half step (not quite a half step). This does not affect the entire LP, and on at least some copies the first five sides, but not the Stucco Homes side, are sharp. It bears repeating that all CDs run at the same (correct) pitch. I have the original Ryko 2-CD set. The track listed as "Shut Up & Play Yer Guitar Some More" on this set is the same as the track called "Shut Up 'n Play Yer Guitar" on the 1995 3-CD set, the UK CBS vinyl box set and the Japanese 3-LP set and vice versa. It would appear to be merely a typo; but wait, it gets better. The booklet in my 2-CD set lists the first four tracks of disc two on page one, followed by tracks 5-11 on pages 2-3, then tracks 1-4 of disc one on page 4, followed by tracks 5-9 of disc 2 on the inside back cover. I would guess that whoever typeset this book looked at the "Shut Up 'n Play Yer Guitar" track and assumed that it should be on page 1. 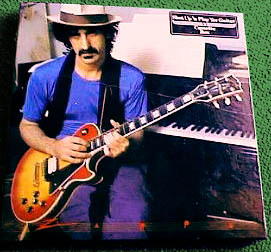 This confusion is also in the Frank Zappa Guitar Book: the transcription called "Shut Up & Play Yer Guitar" matches "Shut Up & Play Yer Guitar Some More" on the triple CD, and vice versa. Although the newer 3-disc set has restored the original "feel" of the triple-LP box, there is something nice about having the whole program condensed onto 2 discs. However if you are going to go hunting for the double set, the chances are you will find them used, so check the pressings. Beware of the PDO pressings of this title because the opening note of "Five-Five-FIVE" is clipped. The attack of the very first cymbal crash simply is not there! This was a very big disappointment when compared to the newer remaster. When I checked out a copy of an original 2-disc version that belonged to a friend of mine, I heard the cymbal was clear and definite. I took a closer look at his discs, and they were manufactured by Shape Optimedia. Obviously they corrected this error, or just did it the right way to begin with. The PDO pressings have a grey label graphic on silver, like a normal early Rykodisc issue with track listings and all, but the silver goes all the way to the hole in the center. The Shape Optimedia pressings also appear with the same label graphics, but have a clear ring around the center that displays the words "SHAPE OPTIMEDIA, INC" and "MADE IN USA" in raised letters. That is the one to look for when searching for copies of this disc. The double disc version of Shut Up 'N Play Yer Guitar that I own fits the above description IE: having the the silver go all the way to the hole in the center. As for the beginning of "Five-Five-Five" being clipped; I can't really tell. It seems like a pretty abrupt start on my vinyl box version as well. I can't tell a difference there. But I can definitely say there are some differences between this version to my friend's copy...His copy was bought around 1988. On that version the track placements (in most cases) come BEFORE the between song grouts (Ed: "Grouts" refers to the 'link' segments Zappa was fond of using to connect tracks during this period)...My "PDO" version besides having the track placements AFTER the "grouts" also has the spaces between original individual album sides tightened up. "While You Were Out" segues with "Treacherous Cretins" whose track mark starts with the "laughing grout" which was originally the end of side 1. We are allowed some silence after "Soup 'N Old Clothes" probably due to it being the actual end of the original vinyl record #1. My "PDO" version also tightens up the space between "Why Johnny Can't Read" and "Stucco Holmes" ever so slightly. Listen to Why Johnny Can�t Read; the cymbal at the beginning pulsates in time with the guitar. The sound quality is much better on the triple CD. Yes, it's actually worth it. The applause from the end of "Why Johnny Can't Read" runs right into "Stucco Homes." This isn't the case on any other edition. I just got Shut Up & Play Yer Guitar in the mail from BMG (the CD club) today and was horrified to see that it wasn't in its box but in a jewel CD case! It's basically the same as the regular boxed '95 CD: the "FZ" logo, same booklet, same CDs, etc. ; but the pics of Frank smoking aren't there. Have you heard anyone else talk about this? You might was to list it on the issues list, but I can't find a special number on the CD other than BMG's catalog number for it, which is D203404. The regular Ryko catalog number is on the discs though. 1981 Analog Master, remastered by Bob Ludwig from the original tapes. Reverts to two CDs (mimicking the approach taken on the pre-1995 CDs), and eliminates the 1995-era segue between "Why Johnny Can't Read" and "Stucco Homes." Reports on sound quality are very positive. What about the Zappa Records CD?